High blood pressure can hit at any time, and the results can be devastating. When an acute jump occurs, knowing how to lower blood pressure in minutes can be the difference between life and death. This is especially true if you’re one of the 75 million American adults suffering from hypertension (the medical term for high blood pressure), or one of the other 75 million with prehypertension. When a boost hits, it’s good to know how to make blood pressure go down quickly. Your blood pressure rises and falls throughout the day, and this is completely normal. Stress, anxiety, exercise, and activity can all lead to increases, while relaxation, getting ready for bed, and sleep can all bring it back down. But not all high blood pressure is safe, and the longer it stays at a high rate, the more health risks you assume. Risks include acute responses like sweating, fainting or shortness of breath, and more severe issues like heart disease and heart attack can arise. So when stress hits, knowing how to lower blood pressure quickly can be a great health benefit. Blood pressure is a measurement of the force that blood applies to your arterial walls as it pumps from your heart throughout your body. It also represents how hard your heart is working to push the blood. When blood pressure is higher, it means the heart must work harder to push blood through your system. In turn, the risk of heart disease or heart attack increases. According to 2014 data, high blood pressure accounts for roughly 1,100 deaths every day in the United States, and only about half of all people with high blood pressure have it under control. A normal blood pressure is in the range of 120 mmHg/80 mmHg (millimeters of mercury). The higher number represents systolic blood pressure and the lower represents diastolic. Prehypertension arises when systolic and diastolic pressures exceed these numbers, and hypertension—or high blood pressure—arises when blood pressure reaches 140 mmHg/90mmHg. Sometimes, however, something causes blood pressure to spike unexpectedly—and the higher your resting blood pressure is, the greater your risk of suffering a severe cardiac event becomes. Therefore, knowing how to lower blood pressure fast is very important. Let’s take a look at some of the more common high-blood pressure triggers. Stress and anxiety: Sudden bouts of stress and anxiety can lead to big increases in heart rate and blood pressure. These can include episodes like arguments, work-related pressures, uncomfortable social situations, and even having blood pressure measured by the doctor. Stress can lead to the release of hormones that can restrict blood vessels. Drugs and medication: Certain drugs and medication can also lead to high blood pressure. Some forms, like birth control, are associated with long-term high blood pressure, while common over-the-counter medications—typically painkillers like “Aspirin,” ibuprofen, “Advil,” and “Motrin”—can all lead to acute spikes. This could be due to the presence of caffeine. Salt-heavy foods: Eating a meal that is really heavy in salt, such as a burger and fries from a restaurant, can lead to water retention that adds pressure along the arterial walls and increases blood pressure. Smoking: Smoking just one cigarette can lead to temporary boosts in blood pressure. Exercise: Exercise can also lead to substantially heightened blood pressure while being performed; however, we will see later that engaging in exercise actually has long-term benefits for lowering blood pressure. Although knowing how to quickly lower blood pressure in certain situations is valuable, it’s more beneficial to focus on how to lower your blood pressure in one day. By doing the things that contribute to a heart-healthy lifestyle day in and day out, you can better prevent and manage high blood pressure. Therefore, monitoring your diet and activity is essential to lowering resting blood pressure. But at times, and particularly in stressful situations, calming yourself and attempting to lower your blood pressure can reduce the risk of a heart attack. One of the best ways to do this is with controlled breathing. Research has shown that breathing techniques can help lower blood pressure quickly, especially in hypertensive patients. If you’ve just been involved in a stressful situation and need to relax, find a place where you can sit up straight or lie down. Ideally, you want to have your torso fully extended so the lungs can accept as much oxygen as possible and you can have deep calming breaths that should help bring your blood pressure down. Diaphragmatic breathing focuses on getting the air deep into the lungs. You can tell you’re doing it properly if your abdomen moves out during inhales through the nose, and goes back in when you exhale through the mouth. A slow pace will likely have the most benefit, so try to make each inhalation and exhalation last for about five seconds. This will take some time to master, but practicing this type of breathing for between five and 15 minutes per day can help. Ultimately, the goal should be to hit about 10 breaths per minutes. If you need a little bit of help, there are devices you can buy to regulate breath time and depth to help measure breathing patterns. 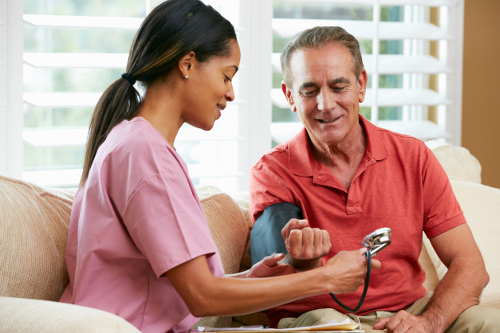 Knowing how to make blood pressure go down quickly can help prevent a major cardiovascular episode, but you also want to take note of what you can do every day to lower your blood pressure. For example, eating a healthy diet rich in fruit, vegetables, whole grains, and healthy fats can limit dense low-density lipoprotein (LDL) deposits along the artery that contribute to high blood pressure. Limiting intake of processed foods can lower sodium intake and total cholesterol. This, in addition to exercise, can also help lead to weight loss. Research indicates that losing as little as nine pounds can have substantial impacts on blood pressure. Exercise can also lead to lower blood pressure. Although performing moderate to vigorous exercise leads to higher blood pressure during activity, it is lowered afterwards. A wealth of studies indicate that getting 150 minutes per week of exercise—whether walking, cycling, gardening, dancing, or weights—can lead to significant drops in blood pressure over time. Try to exercise every day, but even three or four times per week can bring on big improvements. Knowing how to lower blood pressure fast could save your life and protect you from a possible heart attack. That said, focusing on the daily lifestyle decisions you make with respect to your diet and physical activity can help create a safer atmosphere that keeps resting blood pressure at a normal or manageable level. “Blood Pressure Fact Sheet” Centers for Diseases Control and Prevention, June 16, 2016; https://www.cdc.gov/dhdsp/data_statistics/fact_sheets/fs_bloodpressure.htm, last accessed October 16, 2017. Bhammer, D., “Effects of fractionized and continuous exercise on 24-h ambulatory blood pressure,” Medicine and Science in Sports Exercise, 2012 Dec; 44(12):2270-6; DOI: 10.1249/MSS.0b013e3182663117; https://www.ncbi.nlm.nih.gov/pubmed/22776874, last accessed October 16, 2017. “Can Losing Weight Lower Blood Pressure?” PubMed Health, July 1, 2015; https://www.ncbi.nlm.nih.gov/pubmedhealth/PMH0072415/, last accessed October 16, 2017. Grossman, E., et al., “Breathing-control lowers blood pressure,” Journal of Human Hypertension, May 2001; (2001), 15 263–269; DOI: 10.1038/sj.jhh.1001147; https://www.researchgate.net/publication/12015813_Breathing-control_lowers_blood_pressure, last accessed October 16, 2017.